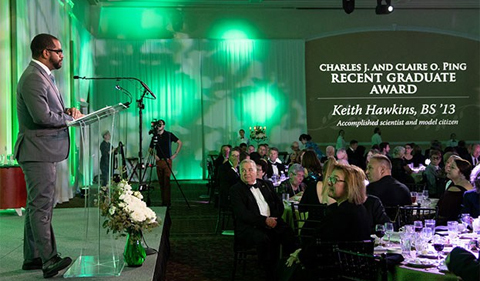 Ohio University alum Keith Hawkins BS ’13 received the Charles J. and Claire O. Ping Recent Graduate Award at the OHIO Alumni Association’s 78th annual Alumni Awards Gala. The award is presented to an OHIO graduate who has achieved incredible success within 15 years of earning his or her first bachelor’s degree. Hawkins earned a B.S. in Astrophysics from the Honors Tutorial College at OHIO, and he serves as a member of the Honors Tutorial College’s Diversity and Inclusion Committee. He earned a Ph.D. from the University of Cambridge and was a Simons Junior Postdoctoral Research Fellow at Columbia University. Hawkins is now an assistant professor of astronomy at the University of Texas at Austin, where he focuses on “galactic & stellar archaeology, chemical composition of stars, stellar spectroscopy, and galactic structure,” according to his web page. Connect with Hawkins on LinkedIn. “…Without the support of my professors and the staff at OU, I would never have been able to accomplish my dreams,” Hawkins said at the ceremony.